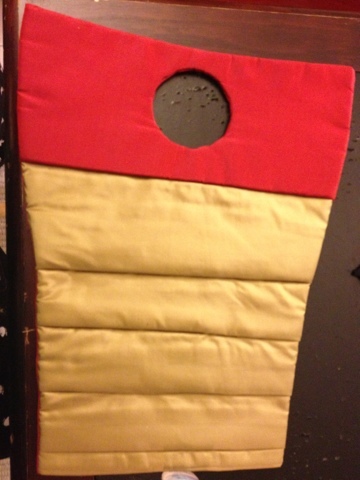 Finished the stomacher - did the lining and the Velcro! 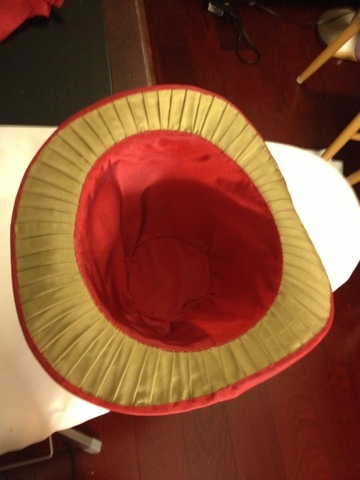 I figured out that I can't attach the collar, and therefor the lining, until I figure out the stomacher part. I have been avoiding doing that like mad 'cuz I have no idea what I am doing, but I bit the bullet and made one today. I think it turned out pretty awesome, and pretty much like I imagined it, although I have no idea if it is too large yet. I guess we'll see! Anyway, I am breathing a sigh of relief now that it is done and I know what I am doing, and I can make it smaller if I need to, so yay, a major stumbling block over. What that *may* mean is that the jacket lining and collar may not get done by today - we'll see. I have so much done from next week's batch that I am not terribly upset about it. 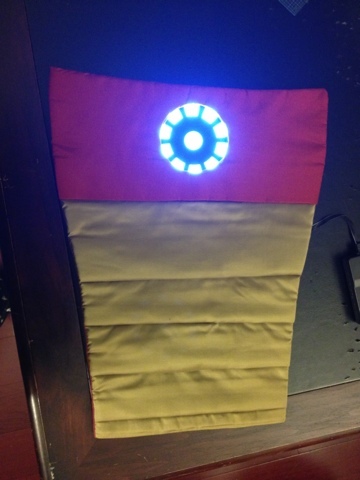 I need to go sew the lining fabric onto it and attach the light velcro to it still. I will update this again when I am done for the night and see if I got any farther. Today did not go as planned, although I got to hang out with friends and catch up with people, so that was good. 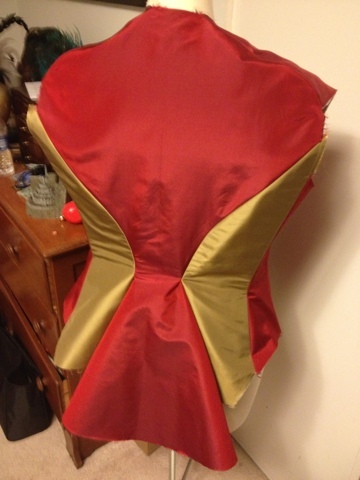 I did get to spend 5 hours boning my jacket though (and not in the awesome way), so that's all done! Well, this week was kind of a wash in general. I wasn't feeling well with some con crud, I had some work to do one night and two of my friends got married this week, so one day was lost to celebrating (well worth it). However, here we are on Friday and I finally have something done that is not hat related! I also created the collar. 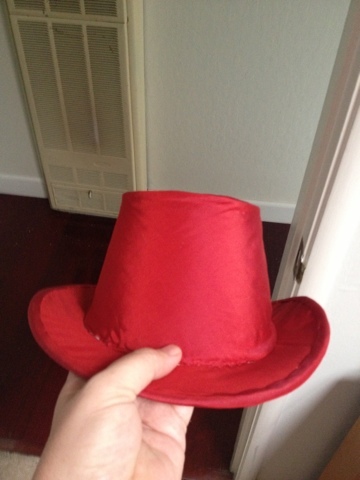 I made it one side red and the other gold so that I can choose which way I want to put it on the jacket when it comes time to attach it. 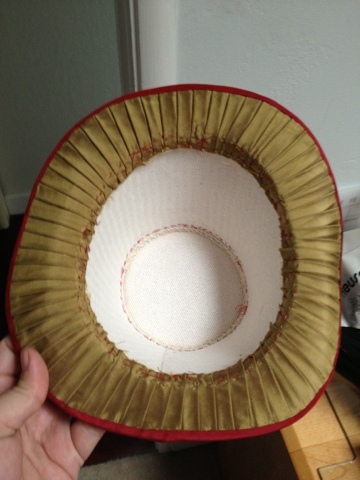 In hat related news, I cut out and sewed in the lining! I have broken down the stuff to be done a bit further by goal dates so that I can stay on track - we'll see if that actually helps or not. :-) I still don;t feel too panicked, but I am edging closer - hopefully this weekend will get me to a good place. I only have to have tea with some friends and that is it, so I should have some good sewing ahead of me. I do seem to have come down with some sort of con-crud though, which is slowing me down some, so I am trying to stay quiet and calm and get through that as fast as possible. More probably tonight when we see where I have gotten to.